Dewalt Heavy-Duty 6-3/4 in. 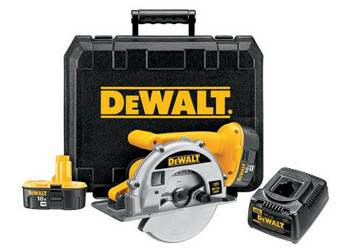 (173mm) 18V Cordless Metal Cutting Circular Saw Kit. 6-3/4" 40-tooth carbide tipped blade cuts up to 2" conduit and pipe in one pass. All Metal Upper and Lower Guards for maximum durability. Multi-Coated SIGHT-LINE™ Window for maximum abrasion resistance. Stainless-steel shoe stays rust free while minimizing chip build-up which prevents marring of the cutting surface. ULTRA SIGHT-LINE™ Scope allows maximum visibility to the cut line. 6-3/4" 40-tooth titanium carbide tipped blade.